I'm definitely one of those New Adult fans saddened by the fact that the genre didn't stick. Sure there was that BOOM a few years ago, but traditional publishers seem to avoid NA books at all costs, and it's been hard to even find self-published material lately. So I was intrigued when I saw Chasing Red on NetGalley. 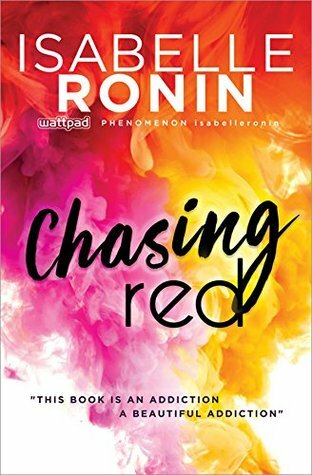 A Wattpad phenomenon, Chasing Red promises exactly what I look for in NA books: college kids falling in love and lots of drama. The problem was I didn't like the drama and I didn't fall in love with the characters. Told from the POV of both main characters, Caleb and Veronica, the book simply lacked any wow factor for me. Caleb's POV chapters were a little better than Veronica's, but not good enough to impress me. As to Veronica, I simply didn't care for her that much. I couldn't connect with them, which means the book didn't have much of a chance of intriguing me. I was mainly disappointed because the premise in itself usually hooks me. I'm a sucker for "the girl in trouble goes to live with bad boy and they fall in love" kind of story, but the lack of chemistry between Caleb and Veronica, the stilted dialogue, and my lack of connection with the characters kept me from fully enganging with the story. No matter how hungry I was for another college romance book, Chasing Red didn't do it for me.